Feed the cells to produce more energy for fat metabolism while supporting and nourishing the body. Herbs: Aloe Vera, Cinnamon*, Dandelion root*, Garcinia cambogia*, Ginger*, Green tea*, Gymnema*, Hibiscus*, Kelp*, Slippery elm*, Yerba mate* Greens: Alfalfa*, Barley grass*, Spirulina* Fruit: Apple*, Lemon, Papaya, Kiwi fruit. 20 servings per pack, (5g, 2 teaspoons). Each (5g) serving is equivelant to; 30g of fresh herbs, 30g of fresh greens, 28g of fresh fruit. There is more energy and nutrients in one serving of boost powder than their is in one $5 cup of coffee or a $8 slice of cake. Each individual powdered medicinal herb, alkalsing greens, fruit and vegtable powder used is up to 8 to 20 times more concentrated in weight giving you a higher dose of nutrients and medicinal phytochemicals in each serve to help you in feeling your best. Aloe vera and slippery elm have been used for their anti-inflammatory soothing and healing properties on the digestive system. Slippery elm and apple contain prebiotic properties, helping to feed the bodies good bacteria creating a healthier environment for good digestion and absorption of nutrients. Cinnamon and ginger are both aromatic assisting in strengthening the digestive system. 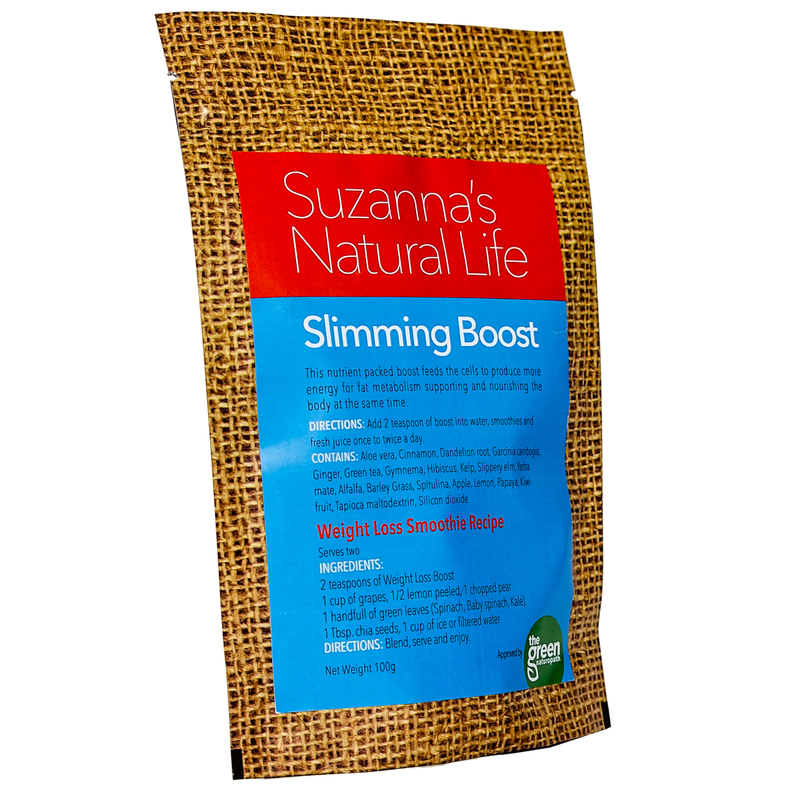 Cinnamon and gymnema are used for assisting with sugar cravings, weight loss and alleviating blood sugar problems. Dandelion root assists in stimulating the liver and stomach to digest foods better. Hibiscus is sweet and cooling reducing heat in the body, assisting with circulation and distribution of nutrients. Green tea and yerba mate mixed together contain important antioxidants that assist in speeding up metabolism. Kelp contains iodine to assist with hormonal health and metabolism. Alfalfa, barley grass and spirulina have been used for their rich source of antioxidants, chlorophyll, fiber, protein and nutrients assisting you to feel fuller for longer, balancing blood sugar levels and assisting in the elimination of toxins. Lemon, papaya and kiwi fruit are a great source of Vitamin C, fiber, antioxidants, nutrients and enzymes that stimulate the liver and assist with digesting protein.